There’s “an undercurrent of dissatisfaction” within the advisor community toward their broker-dealers, the latest J.D. Power poll finds. Plus, advisor loyalty is also decreasing. These shifts seem generally tied to changes in compensation and “a lack of confidence in firm leadership,” according to the J.D. 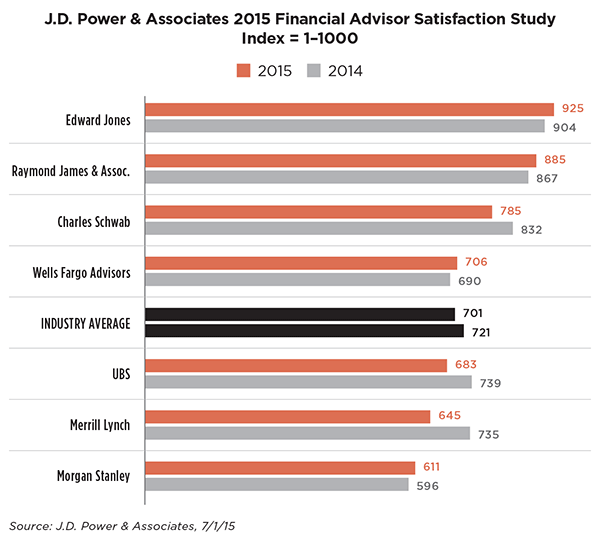 Power 2015 U.S. Financial Advisor Satisfaction Study, released in July. “Many firms have made changes that increase deferred compensation to advisors, which helps increase short-term retention, but doesn’t foster loyalty,” said Michael Foy, director of the wealth management practice at J.D. Power, in a statement. “Given the demographics of the advisor market and the stated goal of many firms to continue to invest in and grow their wealth management business, the demand for proven, successful advisors is likely to increase over time,” Foy explained. The survey includes the views of some 3,300 FAs, many of whom work for the wirehouse firms (Bank of America-Merrill Lynch, Morgan Stanley, Wells Fargo and UBS), as well as for national firms like Edward Jones and Raymond James, which J.D. Power refers to as super-regionals. The poll also incorporated the opinions of independent advisors who are affiliated with broker-dealers but are not employed by them. Of the four wirehouse firms, two have higher satisfaction levels than in 2014. The improvement, though, is limited to 15 or 16 points. The two wirehouses that have lower satisfaction levels this year are down sharply, but over 55 points in one case and by 90 in another. Thus, on average, the wirehouse firms have satisfaction levels that are nearly 29 points off of last year’s levels, and just one of the four broker-dealers has a satisfaction level that is higher than the average level across all firms, 701. Nonetheless, “The year-over-year picture looks worse … and those that did better are still trailing the super-regionals and independents in satisfaction and loyalty,” he explained. Morgan Stanley, though, is less upbeat on the poll: “The survey’s self-selected sample is too small to be statistically valid, and no attempt was made to determine if the sample was in any way reflective of the actual demographics of our advisor population,” the broker-dealer said in a statement. According to Foy, 21% of wirehouse reps say they may or definitely will leave their firm in the next year or two (up from 16% in 2014) and 26% are “at risk” of leaving, based on the absence of a deep commitment to the current firm. In contrast, 15% of independent reps could or plan to depart soon, while 17% are “at risk” of exiting. Overall satisfaction among employee advisors is 701, a 20-point decline from 2014. Plus, although 83% of these reps say they “probably will” or “definitely will” stay with their broker-dealer for the next one or two years, that’s down from 89% in 2014. Of the advisors who intend to stay, 43% cite enduring loyalty, firm leadership, culture, client focus or independence as their main reasons. But 38% point to contract requirements, compensation or the fact that they have no reason to move. In the independent segment, overall satisfaction is much greater on average at 773. Furthermore, nearly 90% of independent reps (89%) say they “probably will” or “definitely will” stay with their current firm. As for employee-advisor satisfaction with compensation, 50% says changes in payout during the past year were negative, up from 41% a year ago, and just 9% percent of these advisors believe their compensation plans have improved. Moreover, advisors with $150 million and up in client assets appear to be more negatively affected than advisors with less than $50 million in client assets, according to J.D. Power. These advisors say their comp plans are more aligned with corporate goals (86%) than with rewarding appropriate behaviors (64%), which reflects the view of some reps “that there is pressure to sell products and services that may not be optimal for their clients,” the research group explains. In contrast, 72% of independent advisors say their compensation remained the same from 2014, and 11% indicate it improved. More than eight in 10 (81%) of independent advisors also believe that compensation rewards appropriate behaviors. Advisor perceptions of leadership—both at the executive and local or branch levels—“leave much to be desired,” according to J.D. Power. A large number of employee reps (42%) say leadership fails to create a strong culture of accountability, and 50% believe their immediate supervisor fails to keep promises/commitments. Furthermore, there’s a lack of effective top-down communication: Just 43% say that leadership clearly communicates strategic goals. In the independent segment, 49% of advisors indicate firm leadership creates a strong culture of accountability, and 45%indicate corporate leadership clearly communicates strategic goals. Executives “need to ensure that the lines of communication are open between leadership and advisors—from the executive suite to the day-to-day face of leadership at the firm’s branch—which can contribute to a culture that advisors desire and help them to effectively manage and grow their practice better than they could elsewhere or out on their own,” J.D. Power states.